Home » Farm Toys » LEGO Minecraft the Farm Review! 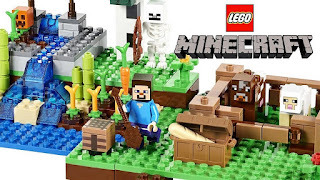 LEGO Minecraft the Farm Review! Agrotechnomarket brings a LEGO Minecraft the Farm review for you guys today. And this is set number 21114 for the farm and it's 260 to pieces you get the two minifigs. You get the Steve you get the skeleton and you get these two animals the sheep and the cow. And you also get this pumpkin growing here which this will work as a head for the Steve character or whatever figure won't put it on. Let's go ahead and take a closer look at our mini figs and the animals. We get here so here's a local so look at the figs. We get here you get the Steve and the skeleton and then you get your two animals which I gotta say I really do like the way they brick built up the animals and obviously. This is a new molding here for the Minecraft animals and you also do get the pumpkin head which you could put on the other figs. We see we do have a little farm scene. You got carrots growing here looks like possibly some sugar cane. You get your pumpkin grow in here. You got some torches kind of light up the way. And I really do like the way they kind of did this little waterfall trickling down on this side. And we do have the chest with some loaf of bread in there. And you can kind of see how they did the little instant area for the animals. And then we do have a little workstation here with a printed tile a couple 1 by 2 printed bricks. 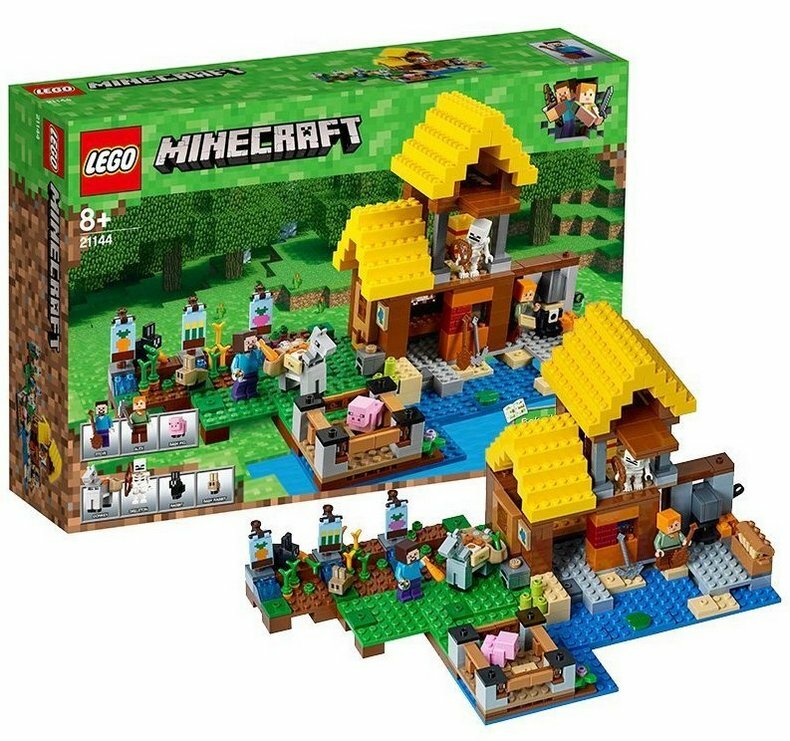 I mean this is kind of one of the cheaper of the Lego Minecraft the Farm sets. This is a good one just to pull long with the other sets may be putting up next to the house obviously these wall under change with one another. And you could put them all together and make yourself a nice little scene display. Lego Minecraft the Farm is appropriate for children aged 8+. It brings together the popular worlds of Minecraft and LEGO. Yield renewable resources with The Farm! Children will enjoy a farm and harvest the renewable resources, so fence in the livestock and channel the flowing water to nurture the crops. 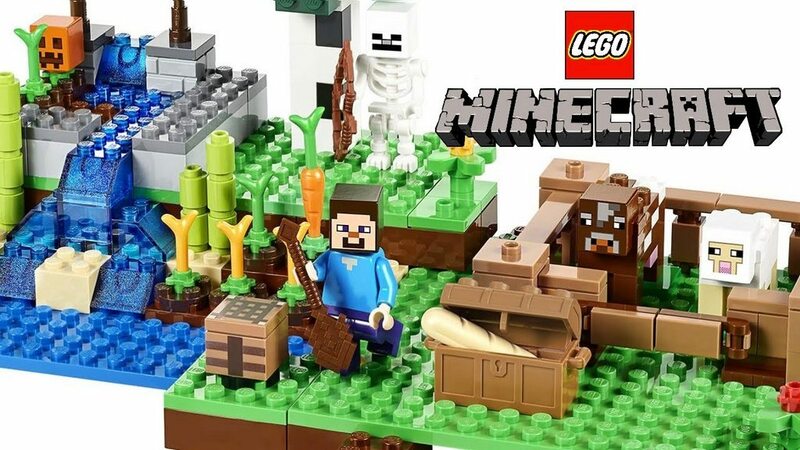 There are lots of accessories including torches, fences, waterfall, harvest pumpkins, sugar cane, wheat, carrots, tree, crafting table, and a Steve mini figure. Use the crafting table to create a pumpkin helmet or jack-o-lantern. But watch out for the skeleton with his bow and arrow after nightfall! Includes a Steve minifigure with an accessory, plus a skeleton, cow and a sheep. The farm toy can be combined with other Minecraft LEGO and LEGO sets to build an entire world. The only limit is your child’s imagination! Farm toys and the exciting world of LEGO come together in the LEGO DUPLO My First Farm. Kids can practice their maker skills as they construct the easy to build barn. Brightly colored blocks feature farm themed illustrations and barn doors and windows open and close. The complete set includes blocks for the barn, LEGO animals, LEGO sheep, the skeleton, LEGO characters, and produce blocks. Accessorize the farm with the LEGO DUPLO My First Tractor. 0 Response to "LEGO Minecraft the Farm Review!"